I have four plants, two different varieties and they all exhibit this issue. Temperatures range from 73 F to 96 F. Plants are watered three times per week in the morning. The location is Houston. The plants are in large pots, lots of soil, mulch and basil at the base of each plant. 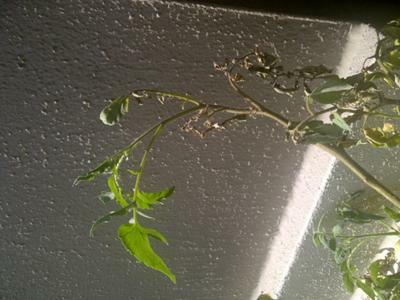 Various leaves or stems turn brown and wither over night, sometimes next to a tomato. I have included pictures.